This is my review for my church’s library of a material that we already have; I’m in the process of trying to listen to and read what our church library consist of, and looking for good materials to stock up so as to edify the believers in my Church. The problem of evil in light of a Christian God has been the focus of many books, lectures and discussions. It would be no suprise then that Christian apologist Dr. Robert A. Morey would address this issue as well, among many other controversies and issues he has tackled in his career. His lecture on this topic is titled “God, Evil and You”. Originally in eight cassette tapes, it is now in five CDs. Throughout the series, Dr. Morey mentioned alot about the need to pursue the topic of evil from a Biblical perspective. This emphasis is indeed needed. Many Christians needed to be reminded today, given the predominance of addressing the issue of evil from a non-biblically based approach (usually in the form of humanistic philosophy), with concepts that are not taught by Scripture, even being antithetical to the Christian God as well. In addition, Morey also bought up the category of discussing the issues in light of metaphysics, epistemology and ethics. His humor is also sprinkled in throughout the lectures which some might find as rather rough. Though this series might be helpful for younger Christians, I think Dr. Morey could have went more deep. This is probably not his best work and an example of his typical work. It took well over half the series to be over before he started actually dealing with the Biblical text on evil and even then it barely touched the surface, though one can gain insight in light of Morey revealing to us the different words for Evil in Hebrew and how many times it appear in Scripture. 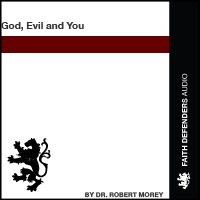 From what has been said by people, Dr. Morey is planning to write a book addressing the issue of the problem of Evil, if it is so, I do expect it to be up to standard as his earlier written works where it is hard hitting, heavily documented and touches on the revelant verses well. Have anyone ever heard of William Wilberforce? And now there’s a movie about his life called ‘AMAZING GRACE’! Its already out in theatre…I need to go see it! “Wilberforce, a member of the English parliament in the 18th century, was a committed Christian who did NOT believe his faith was simply a private matter. Rather, he applied his biblical worldview to the realm of politics and dedicated 30 years of his life to end the slave trade in the British empire. The movie is appropriately called Amazing Grace because Wilberforce was a contemporary and close friend of former slave trader John Newton. Newton’s dramatic conversion led him to write one of the most beloved hymns of all time—Amazing Grace. It is clear that God sovereignly ordained for the lives of Newton and Wilberforce to intersect and fulfill his plan for history. Less known but equally important is his role as a politician who with his missionary friend William Carrey (another hero of mine and interesting in his own right) whom both fought against pro-Imperialists and the East India Company to eventually end the legality of the Caste System as well. Roman catholic Apologist in the hot seat, in defending Purgatory based upon 1 Chorinthians 3. When Harry, 22, left Sandhurst Military Academy last year, he became a second lieutenant and joined the Blues and Royals regiment of the Household Cavalry. At the time, the defense ministry said he could possibly be deployed to Iraq, but that there might be situations when the presence of a member of the royal family could increase the risk for his comrades. Harry himself was having none of it. “There’s no way I’m going to put myself through Sandhurst, and then sit on my arse back home while my boys are out fighting for their country,” he said in a television interview to mark his 21st birthday.